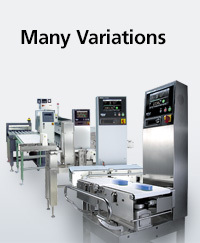 For checkweighers to function properly, operation checking must be performed correctly at each stage of the daily operation: at start-up, during production, and at the end of production. 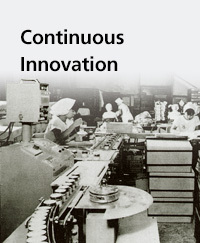 These procedures, although necessary, are not always strictly followed due to the time and effort involved. 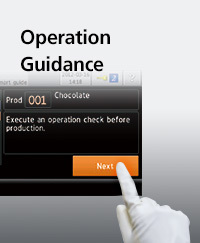 Smart Guide navigates operation check and maintenance procedures in an easy-to-understand format. If a procedure was performed incorrectly, Smart Guide will not allow to proceed further, ensuring correct operation management. All checkweigher weight data and operation check (audit) records are saved local on the SSV checkweigher. At the end of production, the data and operation check log can be sent via E-Reports. The elimination of manual data collection minimizes possible errors and makes data and log management simple and efficient. Product Registration Navigation simplifies parameter setting procedures with step-by-step illustrated instructions. On-screen illustrations help you understand each key procedure. If performed improperly, the navigation stops for corrective action. 8.5" color LCD touch screen interface significantly improves daily use. USB and Ethernet interfaces are equipped as standard features. 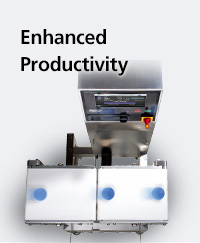 Both metal detector and checkweigher are controlled by the standard touch screen control panel.